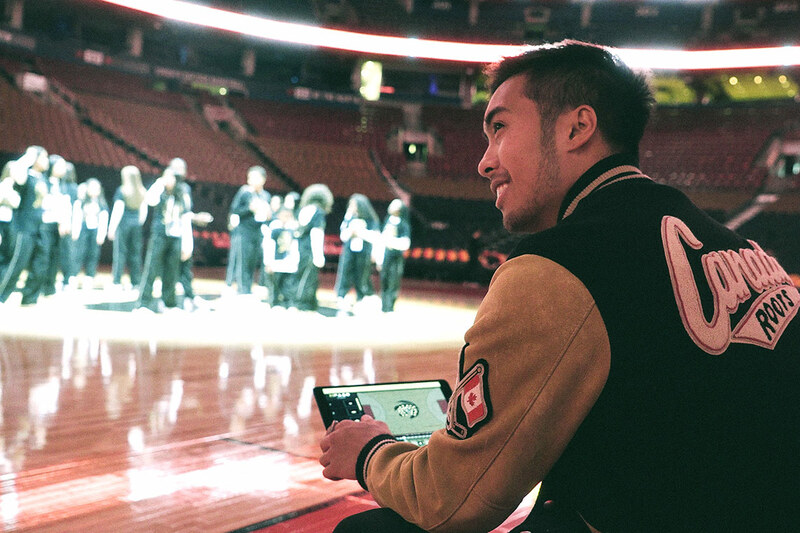 From centre court at Toronto’s Scotiabank Arena, the future looks bright for Axel Villamil and StageKeep, his dance choreography startup. A hip hop dancer himself, Villamil has spent much of the past year using the startup’s app to help the Toronto Raptors dance squad perfect its routines. The app, developed at the University of Toronto, promises to eliminate the pen and paper most choreographers now use to plan their intricate moves – a solution Villamil says is now also on the radar of choreographers associated with a who’s who of musical acts. "We have interest from Justin Timberlake's choreographer and dancers, Drake's choreographer, Cardi B's choreographer and one of Nicki Minaj's past choreographers," says Villamil, who graduated from U of T Scarborough two years ago. Built with co-founder William Mak, StageKeep’s app allows choreographers to plot out their performances in synch with the music while taking into account the size and shape of the performance space. The app also allows choreographers to share their creations with the dancers in advance of rehearsal, saving time and money. In beta testing for the past couple years, StageKeep officially launched the app this year. Villamil and Mak built the company with the help of U of T Scarborough’s The Hub accelerator, one of nine U of T entrepreneurship hubs. Villamil says the market for StageKeep is larger than many non-dancers might assume. His research suggests there are nearly 70,000 dance studios in the United States, with each one employing between three to five choreographers and working with up to 300 dancers. "There's choreographers in places where I didn't even know there were people," he says. An even bigger opportunity could lie with cheerleading squads in the U.S. and Japan, as well as K-pop performers in Korea – and one day the big entertainment conglomerates like Disney, Universal and Sony Music Entertainment, according to Villamil. How did he capture the attention of big acts like Drake and Cardi B? "So my communications guy, Aaron, would go and take the class. And once it's done, he would run up to the choreographer with the app in hand and say, 'Hey, what do you think?'" Since StageKeep’s flagship product was built to solve a real industry problem, Villamil says it tends to instantly win over choreographers – but only once it’s thrust in their face. He’s the first to admit the value of the app can be difficult to describe in the abstract – particularly for non-dancers. That disconnect may have played a role in StageKeep’s recent trip to the Dragons' Den, which aired a few weeks ago online. Villamil and Mak made their pitch, but left the CBC stage empty-handed amid concerns about the startup’s nascent revenue coupled with a relatively small user base. StageKeep currently charges $9 a month to individual choreographers and $39.99 to larger operations – not exactly a cash machine. But Villamil is unapologetic about his startup’s slow-and-steady approach. For now, he says his chief concern is keeping his main client happy. Based on feedback from the Raptors’ choreographer and dancers, he and Mak have fine-tuned their software for commercial customers by ironing out bugs and adding new features. A spokesperson for the Raptors confirmed the organization is working with StageKeep, but declined to comment on how the technology has changed their approach until they've had a chance to explore its full potential. The relationship, says Villamil, has been invaluable – as has the name recognition that comes with being associated with a top NBA team. StageKeep’s name is displayed throughout the arena during the dance routines. "The entertainment industry is a big trust game,” says Villamil, who fully expects his work with MLSE to open doors elsewhere in the NBA. “If you're not known and held up by these big gatekeepers, then you're really nothing – even when the product is astounding."